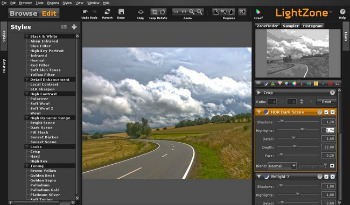 LightZone digital photo editing and workflow software makes it easy to improve your photos. Use LightZone to visually browse and edit photo. LightZone is the essential desktop photo-editing software for people who value their photographs. LightZone is purpose-built for photography and allows anyone, regardless of photographic skillset, to edit photographs quickly and easily. LightZone’s patented image-processing analyzes every photograph and allows photo-editors to make smart visual edits, instantly and with ease. LightZone’s new built-in instant styles, such as Black and White, High Dynamic Range, Local Contrast, Toning, give photo-editors the instant results they want. Tweak a style or dive right in and use LightZone’s intelligent tools to make it your own. LightZone understands the technology of photography, so its users don’t need to. Show GPS metadata from EXIF on Metadata pane. Clicking the GPS metadata will open Google Maps in a web browser. To release unused JVM memory, introduce G1 Garbage Collector. Both MinHeapFreeRatio and MaxHeapFreeRatio are set to 30.